Brokers are sometimes accused of profiting from dividends paid into a cash account that pays you nearly nothing. You can automatically reinvest the dividends for free at most places. If it’s a taxable account, you can always transfer the dividends out manually on your own. Merrill Edge goes the extra mile. They can automatically deposit the dividends to any outside bank account you designate. After you log in, click on Help & Support, and then Forms & Applications. Download the first form on the list of most requested forms: Funds Transfer Service Enrollment. Note in the form you can link any bank account, not just a Bank of America account. 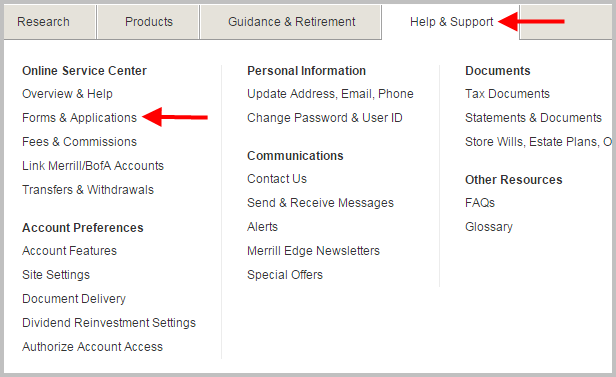 You can choose to link the bank account as one-way into Merrill Edge, one-way out of Merrill Edge, or bidirectional. You can choose to sweep dividends and interest to the bank account daily or monthly. I checked options 2 and 4. Now all dividends will automatically go to my bank account. I will rebalance into whichever fund that needs a boost the most on my own schedule. See Rebalancing With New Cash and +/- 5% Rebalancing Bands. Fidelity can also do this. They make it even easier with an online setup. Just click on Accounts & Trade -> Account Features -> Payments and Transfers -> Automatic Withdrawals. You can choose to withdraw earnings daily to a linked bank account. Is your broker able to automatically deposit dividends to your bank account instead of keeping them in its own cash account or money market fund? This seems to me to be solving a non-problem. It matters not to me if my dividends and interest sit in my brokerage money market fund paying 0.23% or in my bank account paying 0.01%. Some bank accounts pay 1%. Apparently many think that’s a big enough difference. 1) Have you tried getting a letter from a bank for a savings account (no voided check). Annoys me that you need one for setting up ACH. Will Banks easily give such a letter. I use CIT. 2) If you have ACH set up, do you know if you can you just call or change some online setting to do the dividend to Bank option or do you need to fill out that form again. Both are perfect questions for customer service. 🙂 I only linked a “high yield” checking account. Without a voided check or a letter maybe they will let you do one-way out. 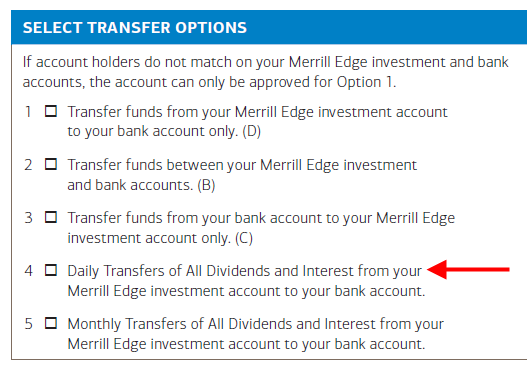 If you already have the bank linked, I don’t see why they can’t change the dividend options for you if you call. Do you have to mail in this form? I’m only seeing a downloadable PDF option. I mailed it. Ask customer service whether attaching a scanned signed copy to a secure message will work if you don’t want to mail. Whats the fees for Merrill Edge? I was manually transferring dividends and was not regular. This will help a lot as my bank savings pays 1.40% whereas merrill edge pays .23%.